Pine Trees And Pearls: Animal Print Is HOT for SPRING! Animal Print Is HOT for SPRING! I don't know about you, but I usually relate animal print to a pattern that I mostly wear in the fall and winter for some reason. 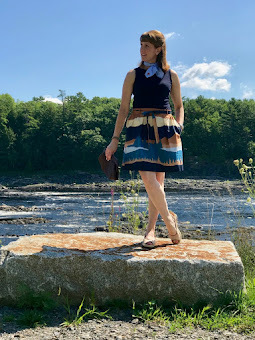 I think that it is because of it's colors of rich browns and golds like in the skirt I am wearing from Talbots in the photo above. Normally in the fall and winter I might pair this with a brown turtleneck, brown tights and brown boots. But since spring has officially arrived, (and you could have fooled me on that one!) I decided to pair it with a cute denim blouse from Newport News and a metallic belt. I also wanted a little bit of color so I threw some red into the mix. Kind of a burgundy scarlet like red. I also would not hesitate to pair this skirt with a nicely fitted white blouse worn under a cute fitted denim blazer.